No more CSVs or static lists. Pull data from your warehouse to your marketing tools with SQL Traits in Personas. The marketer’s role within an organization has changed. It has evolved from focusing on brand-first experiences that can’t be tied directly to business impact to driving data-backed strategies that show quantifiable results. Along the way, marketers pushing the boundaries on technology rely on a common thread: access to accurate, real-time data. Unfortunately, this kind of access to detailed and real-time data is not possible for most marketers. Whenever they want to create a new campaign, they need to ask their analytics team to write a SQL query in their data warehouse, download a CSV, and then upload it to a marketing tool. This process could take days at best and months at worst. And, the process only grants access to web and mobile data. Few marketers can understand the data within a broader context of CRM, POS, and help desk data to augment their messaging. 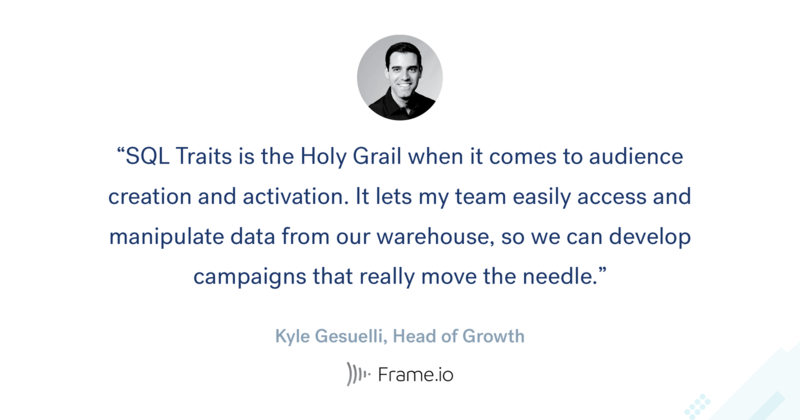 SQL Traits is a new feature in Personas that allows you to use SQL to pull customer data directly from your warehouse into Personas and activate it in your marketing tools. With SQL Traits, you can unlock data in your warehouse that has previously been inaccessible to advertising, marketing automation, and out-of-the-box analytics tools. This includes account data from Salesforce, historical sales data from POS systems, or totally new predictions from your data science team. Any piece of data that’s stored in your warehouse is now available for segmentation and personalization. Access new types of data for marketing. These new data types include object cloud source data like Zendesk, Salesforce or Stripe, historical customer data, data from back end systems, like your POS, or models that your data science team has built. Build any segment imaginable. If it’s possible in SQL and the data is in your warehouse, it’s possible with SQL Traits. You can build audiences with complex calculations from data that exists across tables and data sources. Give your analysts and data engineers time back. The ability to query your data warehouse directly can save hundreds of hours of engineering work by eliminating the need for duplicative data pulls, manual CSV downloads, and simple data transformations. Not to mention, it speeds up marketing’s ability to test and innovate. Request a Personas demo to see SQL Traits in action. With more context around your customers, you have the power to deliver personalized messages throughout their customer journey. And, with fewer data blindspots, there is a much smaller chance of showing an irrelevant promotion or sending an incorrectly personalized email. Once you have access to Personas, you can start using SQL Traits. Within the Computed Trait builder, you simply select SQL Traits, select the correct warehouse, write or paste in your query, preview your audience, and send it to your selected destinations. The editor in Personas works just like an editor that you would use in a BI tool. We currently support Redshift, Snowflake, BigQuery, and Postgres. Check out the docs for more detail. Building your traits and audiences and getting them to the right place is only one piece of the customer engagement puzzle. The success of what you build is dependent on the quality and completeness of the data you are using. If you’re working with an incomplete or inaccurate data set, your product experiences and marketing messages will fall flat. Personas SQL Traits tackles one of the big hurdles that marketers face: data access. Quality and data completeness, two other critical parts of the equation, require a foundation of strong data infrastructure. At Segment, we call this Customer Data Infrastructure. A combined solution for companies that allows you to easily collect your customer data from a variety of different data sources and standardize it to ensure quality, all while elevating the customer as the most essential unit. If you’re already using the advanced version of Personas, the new trait type will be available in the Segment app. Try it for yourself! If you’re not currently a Personas customer or you are a Personas Essentials customer and want to learn more, request a demo here.